The latest installment of Survivor Nicaragua was a lot of fun indeed. After last week when NaOnka and Purple Kelly threw in the towel, leaving the game as quitters and opening the door to the million a little wider for their teammates, the seven who were left immediately began scrambling to shore up shaky alliances. It was three against three, with Chase, Jane, and Holly on one side while Dan, Benry, and Fabio comprised the opposing force. Sash was in the middle; his allegiance up for grabs. Both alliances were courting Sash almost as soon as they returned from the tribal council where the girls dropped out. He knew he was in a powerful position and he let it be known that his vote was for sale. He wasn’t at all concerned about the prospect of being voted out because he has an immunity idol in his pocket. He had a great time entertaining offers from the two alliances. His initial decision was to stick with Chase, who he’s been somewhat aligned with since the beginning anyway. Then Chase did something that put the plan in jeopardy. He won the reward challenge, which was to slide through a mud pit, get three balls onto a barrel and then three sandbags onto another. He got there first but then he slipped up when Probst told him he could take two people with him. He chose Holly and Jane. Holly was a no-brainer; she gave up the last one to get the tribe food and supplies. Jane? He should have chosen Sash. It just looked bad for him not to take Sash when his alliance needed Sash’s support to overpower the others. Chase realized his faux pas almost immediately but there was little he could do to rectify the situation. Both Jane and Holly told him he’d screwed up. While they were enjoying hot food, hot showers, relaxing massages, and soft beds for the night, they were also plotting how to smooth things over with Sash when they got back to camp. Chase’s moment of stupidity in not bringing him along seemed for the time being like an insurmountable obstacle. Back at camp, Sash instantly went to work trying to get Benry, Fabio, and Dan to tell him their game play. The three of them were well aware that they need him to stay together until the finals but their own foundation proved to be less than solid when Sash started poking around. Not only did they not trust Sash to share their thoughts with him but they told him so! Dan called him out immediately. So they did some fist bumping and hinted at a new alliance but nothing was settled. Except that they decided to eat the one remaining chicken. Which set Jane off as soon as she returned the next day with Holly and Chase. The chicken was like a pet to her and she mourned its passing with tears and a solitary vigil on the beach before she made a cross out of its little trimmings that were left over and erected a tiny monument to its life with a heart put together from seashells. It was a touching inclusion in the episode, but also a little out there, if you get the drift. Then it was back to business. The immunity challenge was played and Sash walked away with the coveted necklace. He was the first one to put together a puzzle of fake gold pieces. This put him in a very advantageous position. Not only did he have individual immunity, he also has an idol and he’s still a swing vote for whatever direction he chose to pursue. This he decided not long after the walk back to camp. The Benry/Fabio/Dan alliance was shakier than anybody first thought. As soon as Sash won the necklace the three of them seemed to throw in the towel and started plotting against each other. A plan was hatched to tell Fabio that they were voting off Holly while everyone else would vote for him. Sounds neat, huh? It wasn’t. Sash saw the crack in the trio of guys as the weakness that convinced him to go with Chase, Holly and Jane. After all, he and Chase figured they stood a better chance at defeating the two ladies in individual immunity challenges at the end than if they stayed with Benry and Fabio. So, the deal was sealed and it was finally four against three. And the plan to jettison Fabio? Nobody stopped to get Jane, Holly, Chase, or Sash’s approval on the design. These four saw Benry as the biggest physical threat and with two votes Fabio, one vote Holly, and four votes Benry, the decision was made final with Jeff Probst presiding. Benry’s torch was snuffed, Fabio was gleaming (evidently he forgot that his boys told him to vote for Holly) and the new alliance felt secure. Only nobody knows that Chase has NaOnka’s immunity idol. Maybe he’s not as airheaded as he sometimes acts. And Sash still has his as well. And both idols’ powers expire when it gets down to the final four. Pretty close now, hmmm? For next week, the reward challenge is said to be enough food for four of the remaining six to keep going until the end. Probst drops a bomb with the announcement that the two who don’t win the reward will be “taken off and executed.” Holly looked instantly panicked by this turn of events. Oh, how the mighty are falling as this season winds down. There are only two episodes left. Nobody wants to miss seeing how this one shakes out. The only US hit from Tina Turner’s 1995 Wildest Dreams album, Missing You is a superb cover of an old John Waite hit. Ms. Turner really turns it on with this one. She is the queen of rock n’ roll and when she lets loose on tracks like this one no one can question her decades long reign at the top of her craft. Shot in black and white, the video for Missing You shows Tina doing what she does best. The choreography is just matchless and her searing vocals never sounded more pristine than they do on this cut. A song like Missing You seems like it was written for a powerhouse vocalist like Tina in the first place. The song, the singer, the arrangement, the video, all came together in a brilliant flash of pop music history. Enjoy! Missing You and Tina Turner will get your attention and keep it. This one is a true masterpiece. 1594 - Gustavus II of Sweden was born. 1608 - English poet John Milton was born in London. 1625 - The Treaty of the Hague was signed by England and the Netherlands. The agreement was to subsidize Christian IV of Denmark in his campaign in Germany. 1783 - The first executions at Newgate Prison took place. 1793 - "The American Minerva" was published for the first time. It was the first daily newspaper in New York City and was founded by Noah Webster. 1803 - The 12th Amendment to the U.S. Constitution was passed by the U.S. Congress. With the amendment Electors were directed to vote for a President and for a Vice-President rather than for two choices for President. 1848 - American author and creator of "Uncle Remus and Brer Rabbit," Joel Chandler Harris was born. 1854 - Alfred Lord Tennyson's poem, "The Charge of the Light Brigade," was published in England. 1879 - Thomas Edison organized the Edison Ore Milling Company. 1884 - Levant M. Richardson received a patent for the ball-bearing roller skate. 1892 - In London, "Widowers' Houses," George Bernard Shaw's first play, opened at the Royalty Theater. 1907 - Christmas Seals went on sale for the first time, in the Wilmington, DE, post office. 1926 - The United States Golf Association legalized the use of steel-shafted golf clubs. 1914 - The Edison Phonograph Works was destroyed by fire. 1917 - Turkish troops surrendered Jerusalem to British troops led by Viscount Allenby. 1940 - During World War II, British troops opened their first major offensive in North Africa. 1940 - The Longines Watch Company signed for the first FM radio advertising contract with experimental station W2XOR in New York City. 1941 - China declared war on Japan, Germany and Italy. 1942 - The Aram Khachaturian ballet "Gayane" was first performed by the Kirov Ballet. 1955 - Sugar Ray Robinson knocked out Carl Olson and regained his world middleweight boxing title. 1958 - In Indianapolis, IN, Robert H.W. Welch Jr. and 11 other men met to form the anti-Communist John Birch Society. 1960 - Sperry Rand Corporation unveiled a new computer, known as "Univac 1107." 1960 - The first episode of the British serial "Coronation Street" was screened on ITV. 1962 - "Lawrence of Arabia," by David Lean had its world premiere in London. 1965 - Nikolai V. Podgorny replaced Anastas I. Mikoyan as president of the Presidium of the Supreme Soviet. 1975 - U.S. President Gerald R. Ford signed a $2.3 billion seasonal loan authorization to prevent New York City from having to default. 1978 - The first game of the Women's Pro Basketball League (WBL) was played between the Chicago Hustle and the Milwaukee Does. 1983 - NATO foreign ministers called on the Soviet Union to join in a "comprehensive political dialogue" to ease tensions in the world. 1984 - Iranian security men seized control of the plane ending a five-day hijacking of a Kuwaiti jetliner, which was parked at the Tehran airport. 1985 - In Argentina, five former military junta members received sentences in prison for their roles in the "dirty war" in which nearly 9,000 people had "disappeared." 1987 - West Bank Palestinians launched an intifada (uprising) against Israeli occupation. 1987 - In the Gaza Strip, an Israeli patrol attacked the Jabliya refugee camp. 1990 - Lech Walesa won Poland's first direct presidential election in the country's history. 1990 - Slobodan Milosovic was elected president in Serbia's first free elections in 50 years. 1990 - The first American hostages to be released by Iraq began arriving in the U.S.
1991 - European Community leaders agreed to begin using a single currency in 1999. 1992 - Britain's Prince Charles and Princess Diana announced their separation. 1992 - Clair George, former CIA spy chief, was convicted of lying to the U.S. Congress about the Iran-Contra affair. U.S. President George H.W. Bush later pardoned George. 1992 - U.S. troops arrived in Mogadishu, Somalia, to oversee delivery of international food aid, in operation 'Restore Hope'. 1993 - The U.S. Air Force destroyed the first of 500 Minuteman II missile silos that were marked for elimination under an arms control treaty. 1993 - Astronauts aboard the space shuttle Endeavor completed repairs to the Hubble Space Telescope. 1993 - At Princeton University in New Jersey, scientists produced a controlled fusion reaction equivalent to 3 million watts. 1994 - Representatives of the Irish Republican Army and the British government opened peace talks in Northern Ireland. 1994 - U.S. President Clinton fired Surgeon General Joycelyn Elders after learning that she had told a conference that masturbation should be discussed in school as a part of human sexuality. 1996 - UN Secretary General Boutros-Ghali approved a deal allowing Iraq to resume its exports of oil and easing the UN trade embargo imposed on Iraq in 1990. 1999 - The U.S. announced that it was expelling a Russian diplomat that had been caught gathering information with an eavesdropping device at the U.S. State Department. 2002 - United Airlines filed for Chapter 11 bankruptcy after losing $4 billion in the previous two years. It was the sixth largest bankruptcy filing. 2003 - In Australia, thieves broke into a home and stole two 300-year-old etchings by Rembrandt. The 4-by-4-inch etchings, a self-portait and a depiction of the artist's mother, were valued around $518,000. 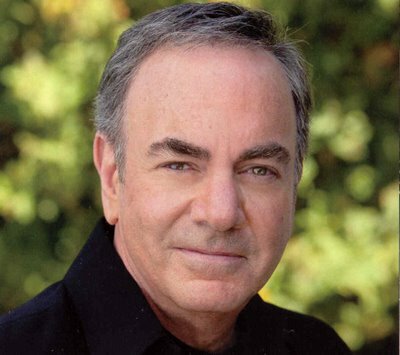 One of the biggest stars of the seventies, Neil Diamond has reigned as a rock star for forty years. His albums are classics and songs like Cracklin’ Rosie, Song Sung Blue, Brother Love’s Traveling Salvation Show, Cherry Cherry, Sweet Caroline, and You Don’t Bring Me Flowers (with Barbra Streisand) defined his career. Neil also became a movie star in the 80’s with his role in The Jazz Singer. His versatility is legendary. A few years ago he released a holiday tune that incorporated his best known songs into a Christmas carol. A Cherry Cherry Christmas instantly became a favorite that resounds on radio to this day. Every year it joins the ranks of the other classics at this time of year. A Cherry Cherry Christmas celebrates Neil’s career while simultaneously spreading holiday cheer. The video Neil made this for song is a heartwarming watch indeed. It shows why this man is the star he is and it displays his incredible range without coming off as a vanity piece in the least. It’s Neil Diamond at his best.